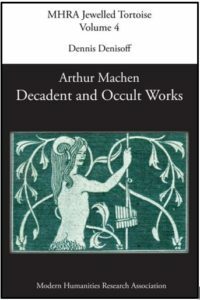 Arthur Machen has finally been recognized as a key contributor to the glittering age of British Decadence. Best known for the novella The Great God Pan and for his formative influence on weird fiction, in fact much of Machen’s writing profoundly challenges literary and cultural convention. From the demonic horror of The Great God Pan and “The Recluse of Bayswater” to the plush occultism of The Hill of Dreams and the prose poems of Ornaments in Jade, this selection of works from throughout Machen’s career brings to life his unique symbolist aesthetics and spiritual philosophy. Volume 4 of the “Jewelled Tortoise,” an MHRA series of critical editions of significant Aesthetic and Decadent texts, this is the first edition of Machen’s work to foreground his Decadent and occult writing. It includes a scholarly introduction, extensive annotations, and revealing contextual materials. Engaging with the gems of Machen’s oeuvre, the collection invites readers to open their minds to a reality beyond the veil, the reality – in Machen’s view – that matters most. Dennis Denisoff is the Ida Barnard McFarlin Chair of English at the University of Tulsa. Hard back: £24.99, $32.99; Paperback: £12.99, $17.99.